1. In a medium bowl, combine cream and white sugar and beat until stiff peaks form. Set aside. You want a stiffer whipped cream for trifle so that it holds up over time. 2. In another bowl beat cheesecake pudding mixes with milk for 2 minutes or until thick. Mix in sour cream and lemon juice. Fold in one cup of the sweetened whipped cream. 3. Slice pound cake into one inch cubes. 4. 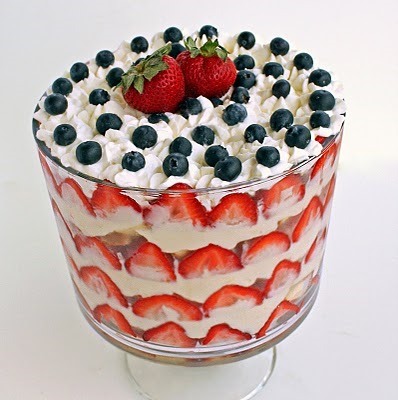 In a trifle bowl, start by layering ¼ of the pound cake on the bottom of the trifle bowl (A large glass bowl can be used if you don't have a trifle bowl). Next, layer ¼ of the pudding mixture followed by a layer of ¼ of the strawberries. 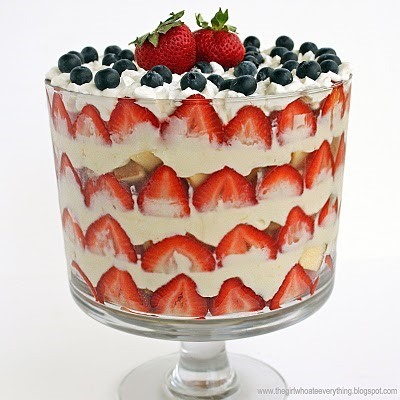 To make trifle look presentable make sure each layer is distinct and separate especially on the sides of the bowl. Repeat layers four times or until bowl is almost full. 5. Garnish the top of the trifle with the remaining whipped cream, strawberries, and blueberries. 6. Chill in refrigerator for at least 4 hours.